not enter his “spheres ” – that is to say. I could not penetrate Master Chin’s defensive energy. Since that first encounter I have come to learn that what Master Chin called “the spheres” is closely connected to an energy named peng-jing (掤勁 ). Literally translated, peng means “ward-off” and jing means applied energy. Although peng-jing can also refer to a particular technique, it more accurately refers to the basic energy of dynamic balance. Dynamic balance is essential to good kung fu; it is the gateway into the secrets of the internal martial arts. Peng-jing is an essential energy, but it is in fact only one part of the fifth principle that forms the I Liq Chuan system. I Liq Chuan (意力拳) means “mind-force-fist.” The art of I Liq Chuan is arranged into specific levels. Each step leads the student to higher levels of mental-physical coordination. The fifth principle is called “The Force Field of Offense and Defense.” The overall art of I Liq Chuan is based on six physical points, three mental factors and a unique quality called “the feel” The concepts described in this article reveal inner aspects of the nature of mind, body and the application energies of the internal martial arts, and will prepare the student for more advanced work . why you’re off balance and on the edges of your feet. In front of such a person, all your techniques seem useless. What’s going on? WHAT IS “MERGING THE SPHERES”? Merging the spheres is a process, not a technique in and of itself. This process is as much mental as it is physical, and it depends heavily on the situation at hand. In essence, merging the spheres means constantly maintaining the proper alignment between a point of contact and your physical-energetic root. By properly aligning the body and mind in this way, a practitioner is able to move, change and respond to a multitude of forces with relative ease. way is necessary based on the conditions at hand. Specifically, the image is that every part of your body has the quality of a sphere. Merging the spheres, then, is the process of feeling that each and every sphere of the body is connected to every other sphere. Spheres are a good model for how our body should be able to receive force. Although our body cannot actually become a sphere, by employing the proper mental-physical connections, we can simulate the strength and dynamics of a sphere. On this point, a student may look into the taiji classics for inspiration, as a careful study of those writings clearly reveals the importance of emulating the sphere. Creating and maintaining the sphere-like structure is the key to accessing the higher levels of the internal arts . A sphere can compress, rotate, uplift or press down. Furthermore, no matter what action is being ta ken, the center of the sphere is always well protected. Although merging the spheres is a physical “feel”, there are mental aspects to it as well. Merging the spheres must be done in every moment of your life. This means that you are always seeking balance and harmony. If you can do that, then you can touch the higher levels . That is to say when your mind and body become aware enough to merge ” the spheres” at all times, then you stand at the gateway to internal skill. The taiji classics mention that internal practitioners should manifest an energy called peng-jing. The relationship between peng-jing and “merging the spheres” is one of process and effect. Merging the spheres is the process that generates the effect known as peng-jing. Many students believe that peng-jing refers to a particular technique. In fact, while peng can be translated as “ward-off” and refers to a move commonly found in many taiji forms, peng-jing refers more-so to an application energy – a state of mind and quality of your body feel. Peng-jing is not just a technique, it should permeate all your movements. Unfortunately, because many students are not taught about the difference mentioned above, their defensive energy is not complete. One’s practice can be improved by considering Master Chin’s teaching on the “merging of the spheres.” The differences between peng-jing and merging the spheres will be discussed more fully later on, but for now it is enough to say this: Peng-jing is the end result of a process. The process is called merging the spheres. Merging the spheres means that mindfulness, qi and proper structure interact on every level of the body-mind. Such an interaction will generate a three dimensional energy force within the body. The three dimensional force is physical, but it is regulated by the mind . With correct interaction of body and mindfulness you will achieve a dynamic state of balance. This balance is what is required to express the higher levels of internal skill. The process of learning and maintaining the peng energy is called merging the spheres. The process of merging the spheres has both a physical and a mental component. The physical component relates to how you hold your body posture. Proper posture is critical to allow for maximal flow of qi and intention . Stiff tension, as well as flaccid softness, are impediments to the proper flow of qi. Dynamic tension-relaxation is the rule. The mental aspect of peng relates to your psycho-emotional state of mind. If you are tense, or obsessed with “winning,” then you will never reach the higher levels . Relax into the nature of your body-mind and there you will find all you need. In the end, peng-jing – or any other worthwhile endeavor – is about self-realization and harmonizing with the nature of things. The martial aspect of the process is only one piece of the puzzle. According to Master Chin, the first step in merging the spheres is creating peng-jing. Pronounced ” pung-jing”, this energy is often translated as ward-off. But the term “wardoff” is misleading. More accurately, peng implies a dynamic relationship between you, your center of mass and whatever force is acting on you at the time. Master Chin teaches that if your peng is true, then you can handle even multiple forces with relative ease. This thought is supported by the taiji classics. In fighting, peng-jing is about maintaining your structure and not letting forces control the center of your mass. Master Sam Chin applies “Grab and Hook”With the difference between circular and spherical types of internal energy now clear, it is important to learn how to bring that understanding into your body-mind. To do this, Master Chin recommends that you imagine that every part of your body is capable of expressing the spherical type force. In all cases, one should feel that the point of contact is spherical. If that can be done, then no matter what the other person does, you can remain poised and balanced. This is easy to say with words, but the skill requires true dedication. “Every part of the body is capable of expressing a spherical energy/, says Master Sam Chin. The energy of this sphere can be solid or light, hard or soft, receptive or warding off. The energy manifested will change as the moment demands . Peng-jing is achieved when you can maintain the fullness of the spheres at all times and on all parts of your body. Changing as the moment requires, projecting here and repelling there, the dynamic interchange of the spheres is what is known as peng-jing. Peng-jing is the basic defensive energy. 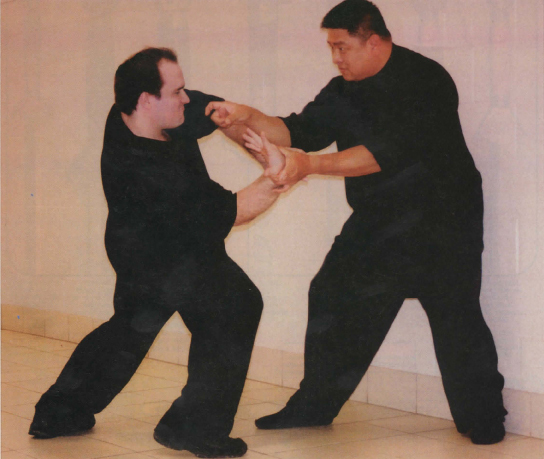 “Because peng-jing is the foundational skill in the martial arts, peng is the gateway to everything else,” says Master Chin. The way of expressing peng is to harmonize the many sphere-like points of contact of the body-mind, and merge them into one. In closing, the process of merging the spheres is feeling the fullness of the “one-ness of the sphere.” The process leading to that oneness is the foundation from which all movement correctly arises. The I Liq Chuan system organizes physical and mental activity in a step-by-step progression. Organized in this way, the student can ultimately achieve unity of body, mind and spirit. With that harmony in hand, one can reap the fullest benefits of the martial, medical and spiritual aspects of this art. This article has revealed some of the essential teachings which, if experimented with, can help lead the practitioner to the higher levels of martial skill.